Register now to participate and complete a short survey for a chance to win $250. Celebrate the environmental and cost-saving benefits of electric vehicles at the first ever Drive Electric Earth Day that will take place in over 200 cities across the nation including Kingsport! Local electric vehicle owners will be on hand to explain their cars and offer rides to the public. The event will feature electric, hybrid, and plug-in hybrid models from Tesla, Chevy, Nissan, and Toyota. 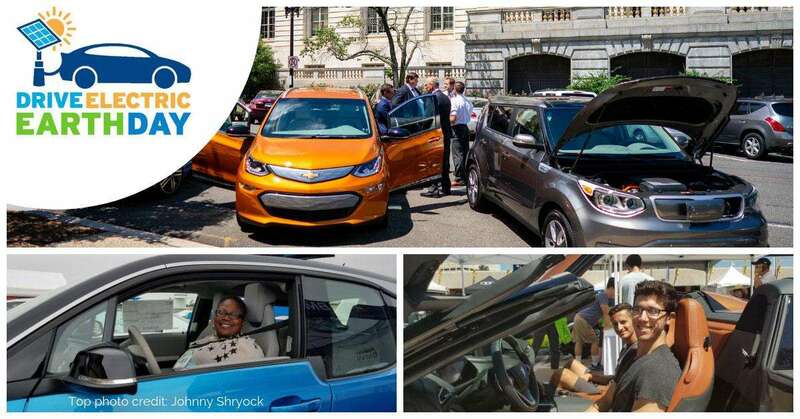 Each event is led by local plug-in drivers and advocates and typically includes some combination of EV parades, ride-and-drives, electric tailgate parties, kids’ activities, great food, press conferences, award ceremonies, informational booths, and more. Kingsport’s Drive Electric Earth Day will be held Sunday afternoon 1:30-3:30 pm, April 28th, 2019 at Meadowview Conference Center. The Meadowview also has an EV charger and several Tesla Destination chargers that will be on display and shown. We will be on the west side of the parking lot near I-26 and close to the Meadowview Parkway.